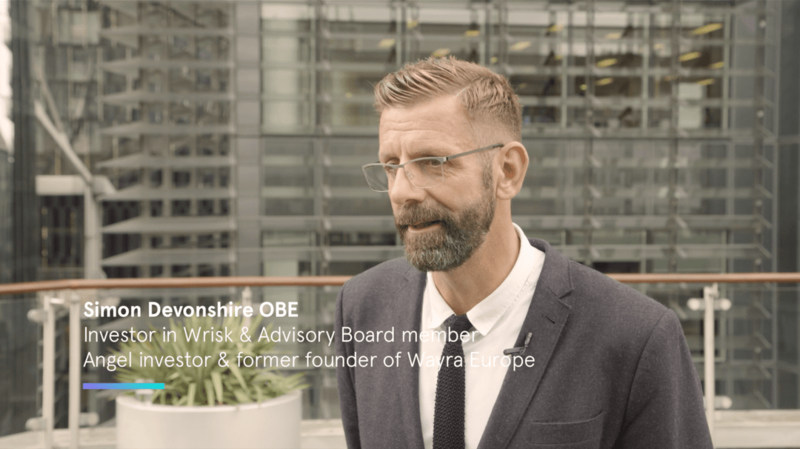 Why noted investor and entrepreneur Simon Devonshire decided to invest in Wrisk and join our advisory board. For me, insurance is not an industry I want to disrupt - itâ€™s an industry I want to help. I think it needs to reinvent itself, I think it needs to evolve, and I think that Wrisk is at the forefront of that. In preparations for our crowdfunding campaign we asked some of our key stakeholders: "What does Wrisk mean to you?" After publishing the thoughts of our advisor David Groom last week, we now have some thoughts from advisor and investor Simon Devonshire OBE. "Hello, Iâ€™m Simon Devonshire. Iâ€™m an angel investor and a non-executive director of several companies - I have a portfolio. In terms of my background: previously a mixture of working for both very big corporates and also startups. With regards to my involvement in Wrisk, Iâ€™m both an investor in it and Iâ€™m also an advisor in it and a shareholder in it. I chose to invest in Wrisk because I think itâ€™s a very special business. I think that Iâ€™ve long held a passion for the opportunity to innovate in the insurance industry. For me, insurance is not an industry I want to disrupt; itâ€™s an industry I want to help. I think it needs to reinvent itself, I think it needs to evolve, and I think that Wrisk is at the forefront of that. So I think that Wrisk is a phenomenal company, and the reason I think itâ€™s going to succeed is because of the quality and endeavour of the founders. One of the key attributes that Iâ€™m looking for is a proven track record of achievement, and they have that in abundance. Iâ€™m also looking for intuition, which they have evidenced demonstrably. And Iâ€™m looking for what I call â€˜inevitabilityâ€™. When I listen to a team talk about their vision, I want to hear and see that its manifestation is totally believable, i.e. that itâ€™s inevitable, that itâ€™s as real as the buildings are around us. And I have no doubt about Wriskâ€™s ability to deliver. Thatâ€™s why I invested in it. I think now is a great time to invest in Wrisk because they have established real traction and momentum, both in terms of the technology build and what it is theyâ€™re trying to do. And what theyâ€™re trying to do is actually really special. Itâ€™s not one thing, itâ€™s three things. So theyâ€™re creating a fantastic digital interface. Itâ€™s much more than just the superficial UX skin, but also reinventing the guts of the actual insurance itself, which is something thatâ€™s technically very challenging to do. And then thirdly, theyâ€™re creating this idea of a personal Wrisk Score, in the same way that the financial services has credit scores. Theyâ€™re enabling the transaction to be a transparent one, where the customer is ultimately in control. And for those reasons, I think about of all of the ventures that Iâ€™ve been involved in, having run and created Wayra Europe over three-and-a-half years. On behalf of TelefÃ³nica I invested in 234 businesses. In my own personal portfolio I only have eight, and one of those that Iâ€™m most proud of is Wrisk."